Made By Our Vintage Blog Queen! Hello, my sewing darlings! I have announced that there is something new coming up on the blog. I could not be more excited! 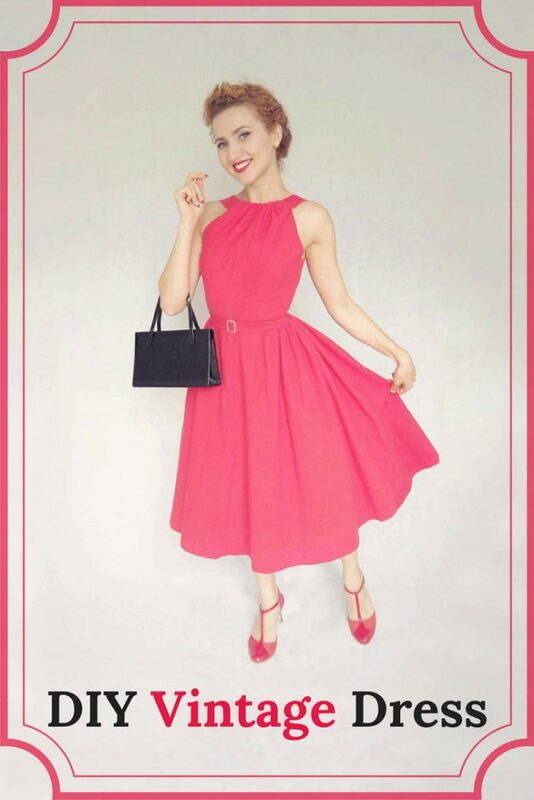 Let me introduce you to one of the most beautiful vintage patterns I have ever seen, the vintage pattern collector who makes my knees go weak with her collection and my humble creation – The Red Vintage-Style Dress. 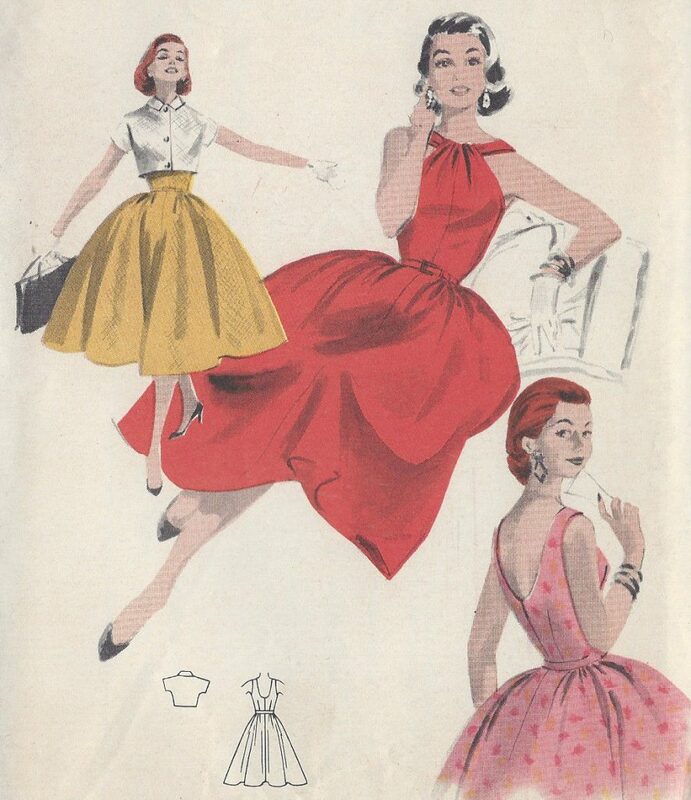 It’s a pattern from the 1950’s, it has a deep back, gathered neckline, and a flared skirt. It has a pattern for a matching bolero too! I couldn’t get this dress out of my mind and gave in to my temptation. The pattern arrived in my mail and let me say… It surprised me on many levels. This pattern is different because it is an original vintage pattern, however a reproduction of the original. It is printed on a brown paper which looks very similar to vintage tissue paper, but it looks a bit more durable. Let me just say, that as much as I love vintage patterns, it was a relief to buy a reproduction. This way I had no guilt whatsoever while cutting into it. If I buy an original vintage pattern I usually trace it onto a new pattern paper and don’t cut the original. It is a lot of extra work. I got in touch with the seller to express how much I liked the pattern and we started exchanging emails. I won’t bore you with too many details. Needless to say, I was enchanted with this company. Turns out that Sonny, the founder, has been collecting vintage patterns for nearly 45 years now!!! I am so happy to announce to you all that I became the official ambassador of The Vintage Pattern Shop! In the following months, I will have the pleasure to show you my creations based on the patterns from Sonny’s collection. It will be an opportunity for all of us to see the vintage patterns brought to life and worn in the modern world. Without further ado, allow me to show you what I made. The pattern itself is surprisingly easy. I couldn’t believe that I can make such a gorgeous dress in one day, but here it is! The fitting process was very easy too because the bodice fits me pretty well. The only thing I regret is not making it a bit tighter around my waist and gathering the top of the bodice instead of making pleads which would probably look more regular. The only drawback of the pattern is that I honestly don’t know how many petticoats would I have to wear underneath to make it as puffy as the dresses on the pattern’s cover. Perhaps I am too infatuated with those vintage illustrations after all! I already had a chance to take this dress downtown and I swear it stopped people in their tracks. Seriously! I would love to share with you guys one of my favorite memories concerning this dress. One evening, I was hurrying to catch my metro and an elderly couple was coming from the opposite direction. When I got closer to them, I suddenly saw the lady stop in front of me, she clasped her hands over her heart and exclaimed: “You are LOVELY!”. Let me just add that I currently live in Norway and people here are not exactly known for profuse emotional reactions to anything, so her kind, enthusiastic words truly touched me. Please let me know in the comments what do you think about this dress. Did you like how it turned out? 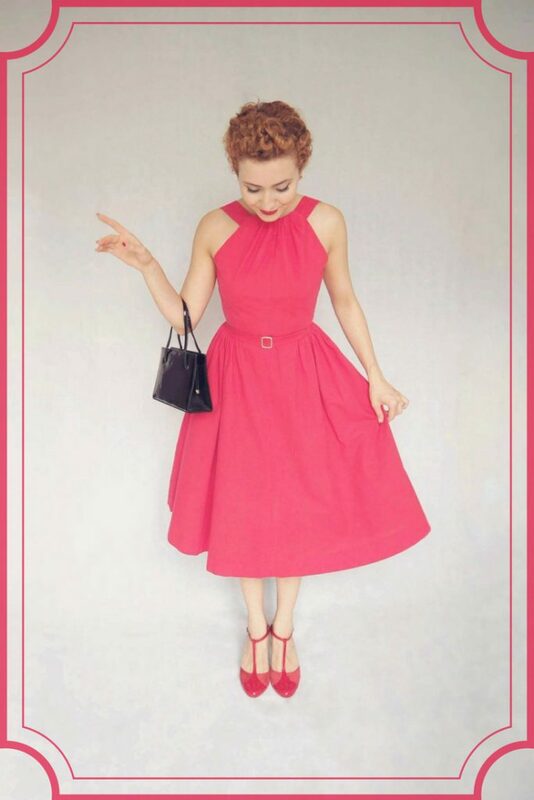 Would you like to make this dress? If yes, here is the link. Click in peace. 🙂 I wrote this post out of genuine love for The Vintage Pattern Shop and this stunning dress. Marlena’s next blog coming soon!